Good news for anime fans worldwide: Hayao Miyazaki’s new film hits theaters July 20. Yesterday reporters descended on Studio Ghibli, the workspace of lauded anime director Hayao Miyazaki, in suburban Tokyo to discuss a matter of great import for fans of Japanese animated films worldwide: Kaze Tachinu (The Wind Has Risen), his first film since Ponyo in 2008. 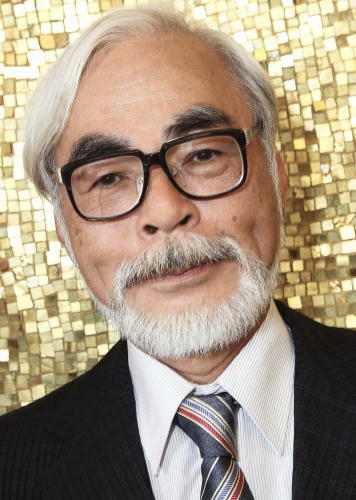 The white-bearded, spectacled legend – considered a genius by many – unveiled some of the details of the film, which he both wrote and directed, and gushed over the dedication and hard work of his staff and the cast, which includes musician Yumi Matsutoya, who penned the film’s theme song (“Hikouki Gumo,” translated as “Contrail”) and director Hideaki Anno, who performed the voice acting for the lead character. They can be seen together here. Of note, long-time collaborator, composer Joe Hisaishi, has come together with Miyazaki again to write the score for the film. “My staff really worked hard to bring these very complex scenes to the screen,” he told the journalists. From the sounds of it, Kaze Tachinu’s complexities take a more realistic tone than Miyazaki’s more fantastic fare that is apparently near to his heart. The film is adapted from a manga of the same name, which is a fictionalized biopic that explores the inner conflict of a real-life aircraft designer, Jiro Horikoshi (1903-1982), who designed the Mitsubishi A6M Zero fighter used by the Japanese Imperial Army’s kamikaze pilots during World War II. The tale traces Jiro’s life from ages 10 to 40 at the height of WWII. Compared with Miyazaki’s past works, which include classics like Nausicaä of the Valley of the Wind, My Neighbor Totoro, Princess Mononoke, Oscar winner Spirited Away and the Oscar-nominated Howl’s Moving Castle; Kaze Tachinu has taken on an especially autobiographical flavor, incorporating books, music and people who have touched Miyazaki’s life. Perhaps the most significant link to his life: Miyazaki’s father was director of Miyazaki Airplane, owned by the director’s uncle, which made rudders for the Zero fighter. As noted by Ghibli Blog, like many of Miyazaki’s films Kaze Tachinu is an interesting amalgam of personal statement and adapted biography. There is, however, one significant break from the bulk of his wildly imaginative filmography. Following the 3/11 trip disaster that left much of Tohoku in ruins, Miyazaki publicly declared that Studio Ghibli would shun fantasy story lines in favor of more realistic stories that address issues facing us today. Kaze Tachinu, which incorporates a scene from the Great Kanto Earthquake of 1923, is the first official step in that direction. Although a story rooted in reality, one link with the director’s other works is the importance of flying. Like young Pazu, the lead role in Castle in the Sky, Kaze Tachima revolves around a character whose life plays out in the air. From post-apocalypse to Japan’s spirit world, mammoth flying machines, airplanes, blimps, dragons, broomsticks, and sundry winged creatures are a common element in his work. Another common theme is conflict – man vs. nature, good and evil, love – that in the end is always transformative for the hero (or heroine – there are many) in the story. While conflict and even a dose of violence are common in his films, a greater sense of beauty always shines through. During his pitch for the 1997 film Princess Mononoke, Miyazaki said, “Even in the middle of hatred and killings, there are things worth living for… a beautiful thing can exist.” This statement seems just as relevant to his art today as it was then. Kaze Tachinu is scheduled to hit Japanese theaters on July 20. Screenshots can be seen here and a brief teaser (in Japanese) – revealing a surprisingly vibrant color palate – can be seen here.